Is this the world's most efficient solar system? Is this the world’s most efficient solar system? When it comes to solar electricity, efficiency is the key to success. And a new solar electric project in South Africa’s Kalahari Desert may just be the most efficient system that exists in the world today. 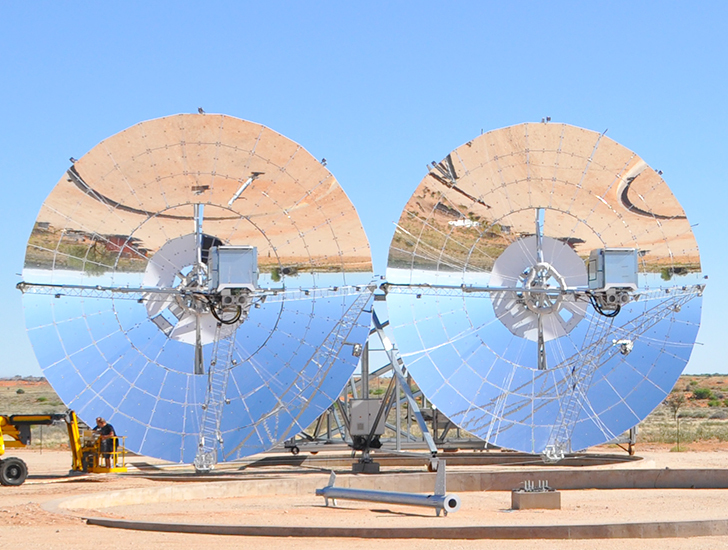 Swedish energy company, Ripasso, is taking advantage of the intense South African Sun to test its small-scale solar concentrator system that combines military technology with an idea from a 19th century Scottish engineer and clergyman. The results? The system converts a whopping 34 percent of the sun energy into electricity that goes straight into the grid. That’s about twice as much as traditional solar systems. 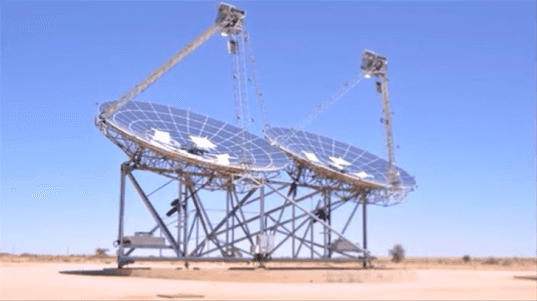 According to the Guardian, this is the only working small-scale concentrated solar system of its kind, but the creators hope it will become one of the biggest competitors for renewable energy on the planet. The system uses giant 1,000-square-foot dishes that rotate to follow the sun and constantly adjust themselves to capture the maximum amount of solar energy possible. Independent tests conducted on the project show one of these dishes can produce between 75 and 85 megawatt hours of renewable electricity in a year–or enough to power about eight American homes for a year. In the process, the renewable power would cut about 81 metric tons of carbon dioxide emissions when compared to the same amount of electricity produced by burning coal. The project is modeled on the Stirling engine, developed by Scottish engineer Reverend Robert Stirling in 1826 as an alternative to the steam engine. Stirling’s engine used alternating heating and cooling of enclosed gas to drive pistons and turn a flywheel. Due to limited availability of materials at the time, the engine wasn’t commercially developed until 1988, when a Swedish defense contractor began making them for submarines. Repasso CEO Gunnar Larsson worked in Swedish defense industry for 20 years before realizing how the engine could be applied to renewable energy systems. That was one bright idea. I'm relieved that someone pick up the ball that SES (Stirling Energy Systems ) fumbled a few years back. This design was always promising as a basis for utility-scaled solar generation. Everything I've read points to rooftop photovoltaic as being the future of the solar energy industry whereas this system only seems to be able to work in conjunction with large scale solar farms. Ripasso's generator may be the world's most efficient. Ripasso's solar concentrator follows the sun and adjusts as necessary.